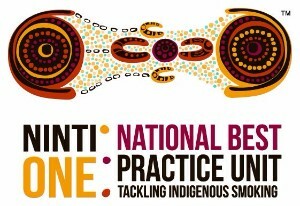 Welcome to the next update from the National Best Practice Unit for Tackling Indigenous Smoking (NBPU TIS). The NBPU TIS online resources are currently being finalised and will be launched in March. We will provide weekly updates to grant recipients in this format until the formal launch. Feel free to contact us as outlined below. My apologies for the lateness of this newsletter, but again it has been a jam packed week with consultation visits with Desley, Manager of the NBPU TIS, now having finalised all three Qld organisations. 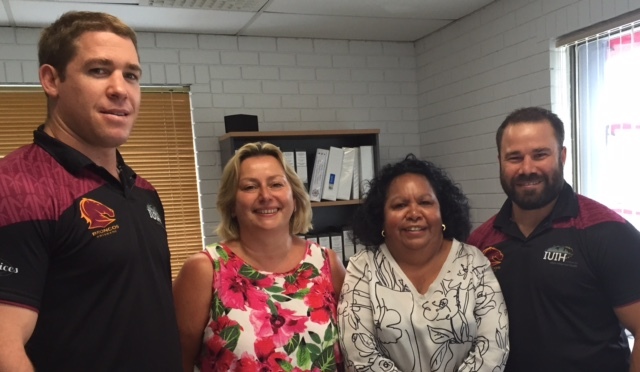 On Monday Desley and Penney had a great meeting with Keiron and Ian at the Institute for Urban Indigenous Health in Brisbane and found the organisation to have great approaches to the TIS program in the various communities they service. That same day, Desley met the wonderful staff at Carbal Medical Centre in Toowoomba who have some great ideas going forward with TIS. Then the rest of the week was travelling to the beautiful Ballina, Coffs Harbour and finally over to Kalgoorlie. 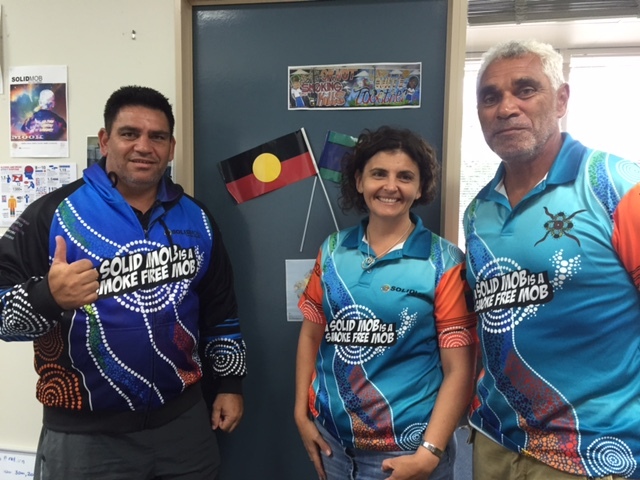 Left to right: Michael, Jody and Mook from "Solid Mob" Bullinah Aboriginal Health Service (Ballina). Desley was invited to attend the WA Aboriginal Tobacco Control Strategic Leadership Group Meeting in Kalgoorlie on Friday. The meeting was attended by a number of organisations from all over WA which was a great opportunity for Desley to introduce the Unit to all participants plus also introduce Kathy and Millie from the HealthInfoNet team and promote how this team is supporting the NBPU TIS. 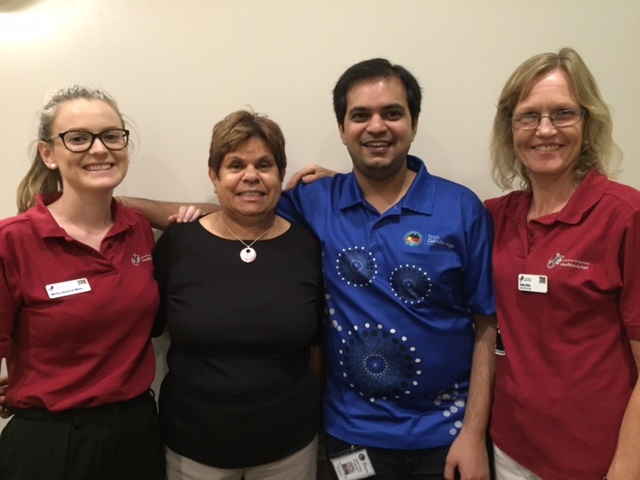 Left to right: Millie (HealthInfoNet) Irene (Bega Garnbirringu), Sachin (Bega Garnbirringu) and Kathy (HealthInfoNet). 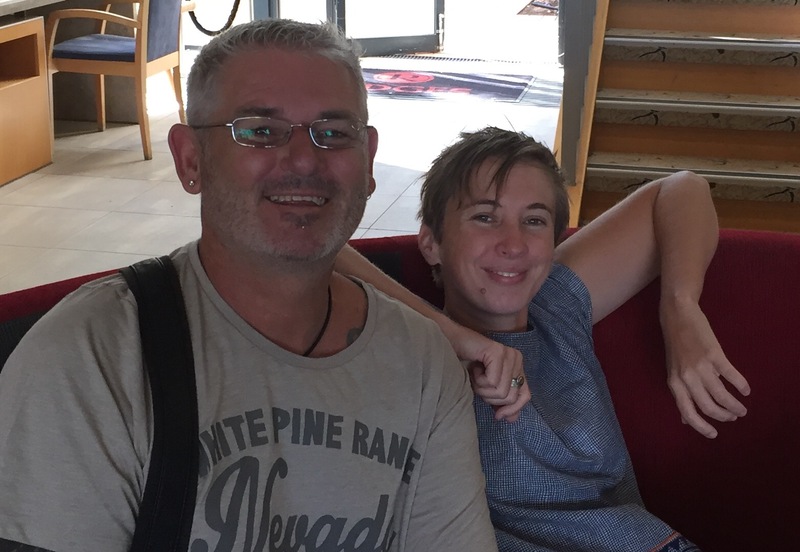 Left to right: David and Emma from Broome Regional Aboriginal Medical Service . Some really exciting news for NBPU TIS, we have finally got a logo specifically for the Unit. The original artwork was developed by Allan Sumner, an accomplished South Australian artist. He is a descendant of 3 Aboriginal peoples being the Ngarrindjeri people from the lower river and lakes of the Murray River along the Coorong, the Adelaide plains Kaurna people and the Yankunytjatjara people from central Australia. The story behind the logo concept and description of the artwork is below. 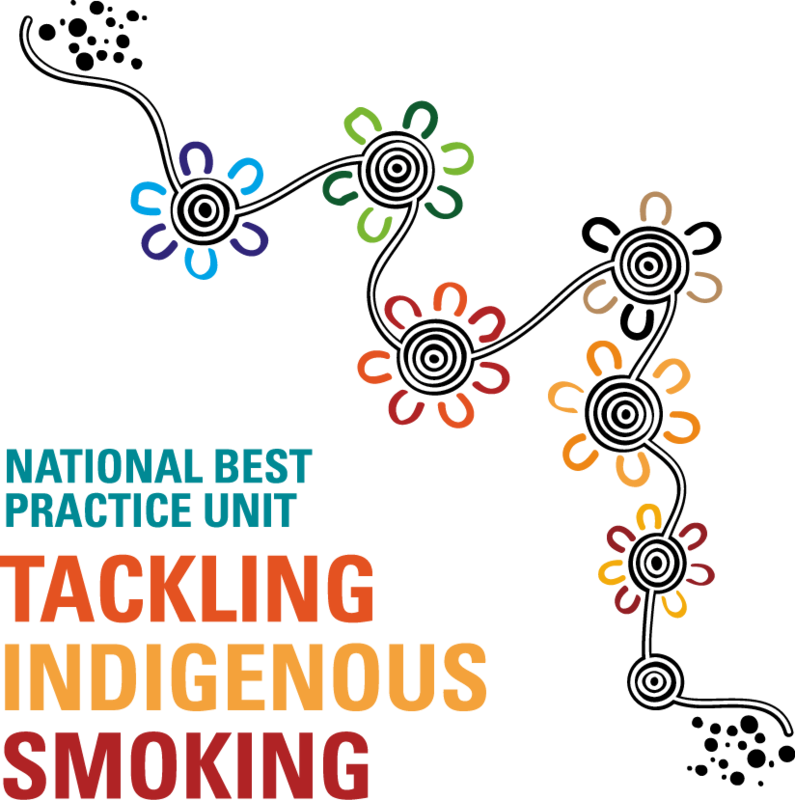 The logo represents how the National Best Practice Unit supports regional tobacco grant recipients across Australia in their efforts to reduce the rates of smoking among Aboriginal and Torres Strait Islander people. 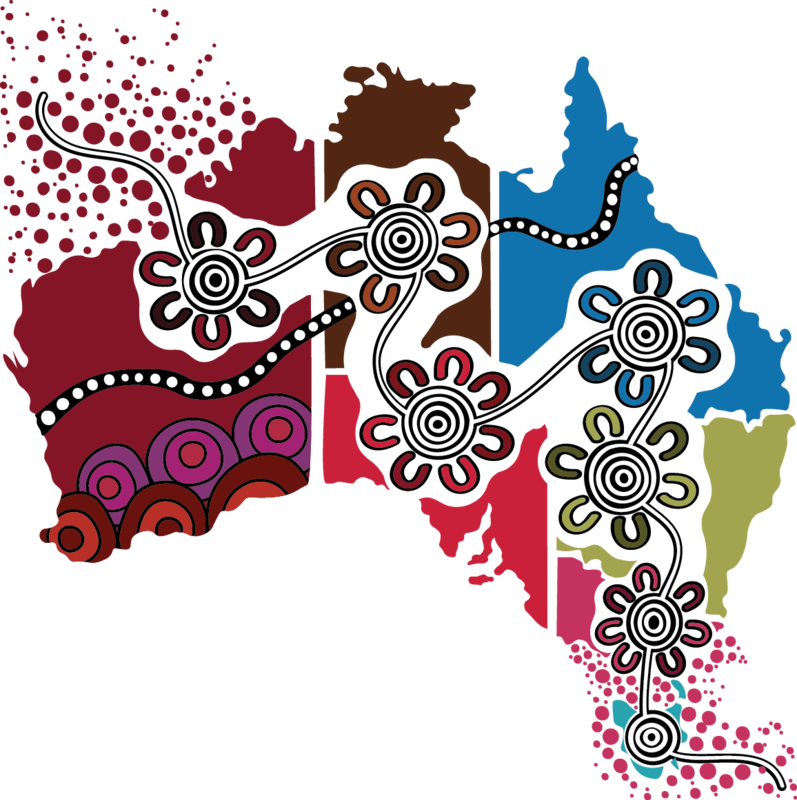 The circles represent the National Best Practice Unit's various meeting places with grant recipients across all states and territories and the travelling lines are depicted between them. The dots at the top left and bottom right represent the creation of new pathways in Tackling Tobacco, breaking away the barriers and reducing the rates of smoking among Aboriginal and Torres Strait Islander communities. From this, the logo was designed. The next newsletter will have our new logo on it and all other materials from NBPU TIS will also be branded with this logo.